Summer is all about having fun, relaxing and switching things up! Warm weather means you can spend more time outside, enjoy being with the kids while they are on school holidays, and take advantage of long weekends with getaways! Routines often get broken with changing schedules and last minute celebrations. Embrace the change and indulge your sweet tooth with the perfect summer treat or meal idea: crepes! 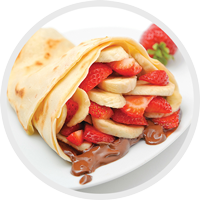 They are Versatile – Crepes are just like summer schedules: they evolve with your mood! Whether you want a sweet treat to accompany a summer sunset or a filling breakfast to kick-start your morning, Crepe Delicious has the perfect crepe on our menu for your needs. Crepes are perfect for relaxing by the pool, lunching on the go, or for catching up with friends over dessert. Order a crepe with gelato to cool down with a summer snack, or eat a hearty savoury crepe filled with vegetables before a busy afternoon or long drive! They are Healthy – Summer is all about eating lighter meals, moving outside and getting in great shape. 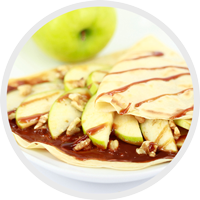 Crepe Delicious offers a diverse menu that is filled with fresh, tasty and healthy ingredients to get your whole family eating right. No matter how busy your schedule or how quickly you need to get there, Crepe Delicious makes eating healthy a breeze with great fast food options to suit everyone’s taste buds. Our California Chicken is our featured crepe this month, so you can save while you nourish your body. It’s packed with lean protein and fresh veggies, making it the perfect warm weather meal at any hour of the day. They are Fresh – For many people, images of fresh salads and fruit come to mind when people talk about summer! Crepe Delicious has plenty of options that fit the bill and they are made right before your eyes. We recommend trying the Banana Split for a potassium-loaded sweet treat or our Caramel Apple crepe for a delicious and fresh indulgence! Our Tuttie-Fruittie crepe is also packed with candied fruits that will perfectly match the hot temperatures. You’ll be able to satisfy your sweet tooth without the guilt. Looking for a refreshing alternative to fast food this summer? 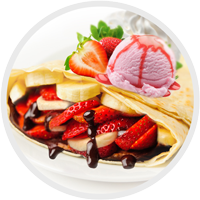 Check out the wide selection of crepes and gelatos at Crepe Delicious. Check out our menu and find a location near you to try your favourite flavour.